With a 2017 PWC CEO survey referring to the job market for data scientists and analytics as an area of ‘hyper growth’, it’s clear that many organisations are staffing up their analytics teams — but is there a best practice way to do it? Whether it’s to improve the quality and speed of your decision making, gain deeper customer insight or drive efficiencies into business operations, the common denominator for success is an effective analytics team. Many studies show the concrete benefits of becoming ‘analytics enabled’, but what is much less clear is how to build that capability within an organisation. If you can afford an analytics team of more than eight and some budget for a partner, the hybrid model and centre of excellence combination is the most likely to give you a successful outcome. When looking at your internal capability, understanding what kinds of skills you need is just as important as knowing how many people you’ll require. This will change over time as your business needs change and your general analytics capability rises — not just in the analytics team, but also in the business users who are exposed to addictive analytics. When it comes to focusing the team on areas that will produce value, it’s easier at the top end — so identify two or three really important analytics projects and let them get started (see here for how to select those). Build your capability to deliver on those use cases and then expand from there. This ensures you don’t build capability you don’t need. 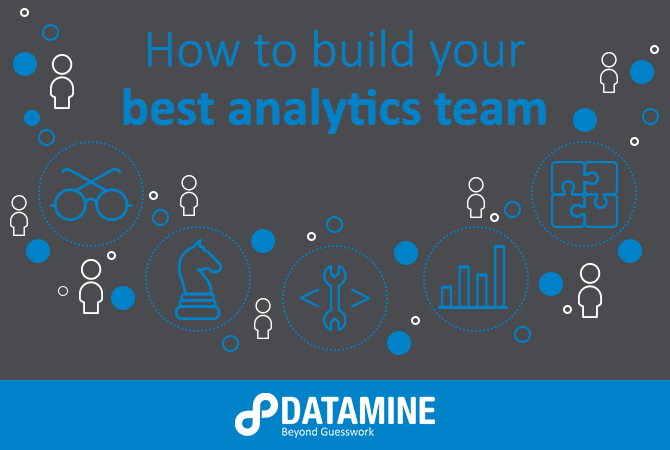 After the big wins, you will still achieve a lot of value from your analytics team, but it will require more effort directed towards defining exactly what that value is and prioritising projects. This is where an outsource partner comes in handy. They will typically have been exposed to organisations in similar situations to your own, and will be experienced in identifying and defining the value opportunities in your business. If your governance process is good, then you will achieve a strong return on your investment without having to worry about fitting these projects into your analytics team workflow. Keys to success here are central visibility and permission for business units to engage the partner if their work is not getting into the analytics team's priorities. There should always be a checkpoint near the end of the scoping process to determine if the internal team should do the work or not.